How many screens are you viewing as you read this? While I’d like your complete and undivided attention, chances are you’re viewing more than one screen right now based on recent research from Google, Ipsos and Sterling Brand. For marketers this is a major challenge since they don’t have their audience’s focused attention. And even if they do have their audience’s attention, it’s likely to be interrupted at anytime by another device. This is one reason content context is important. This is device hopping where the user moves from one device to another to accomplish a specific task. 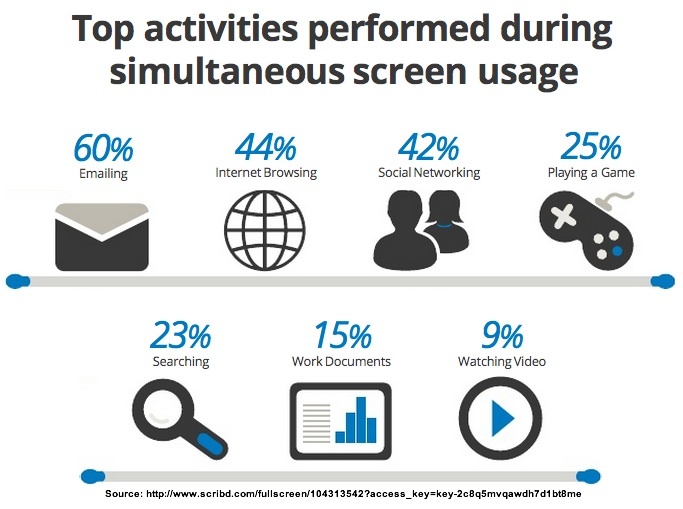 90% of users use multiple screens to accomplish a task over time. Of these, 98% move between multiple screens in one day. 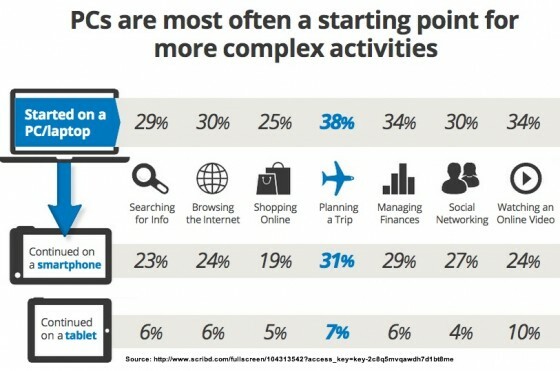 The top activities include browsing the Internet, social networking, shopping online and searching for information. Interestingly, consumers have developed a variety of methods to support moving between screens, search, direct navigation and email (link forwarding). While search is used most often, the other methods are employed a significant proportion of the time. 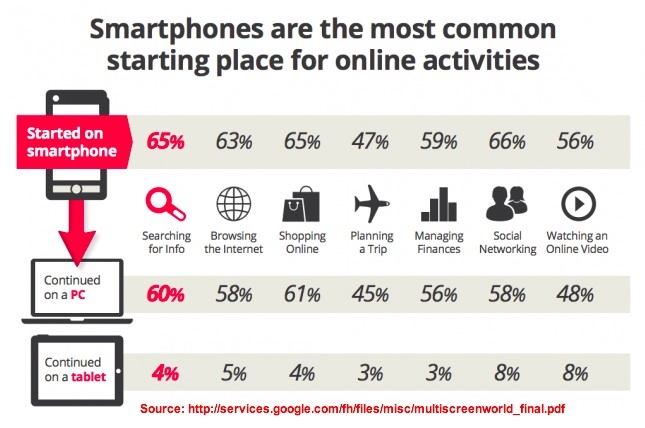 Smartphones are where we start most online activities – which isn’t surprising as they are always on devices, always within reach. 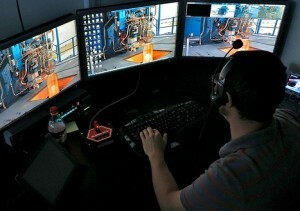 Computers are the starting point for more complex activities, most likely because it puts us in a work frame of mind. 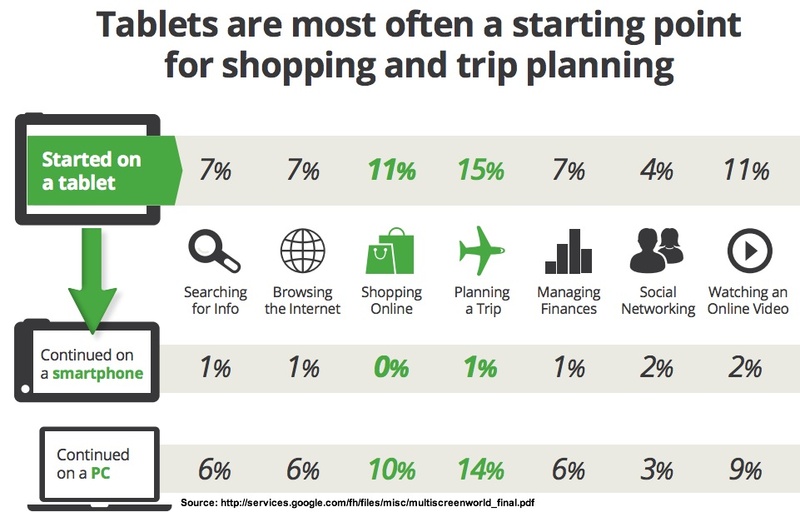 Tablets are used most often for personal activities such as shopping, trip planning and viewing video. 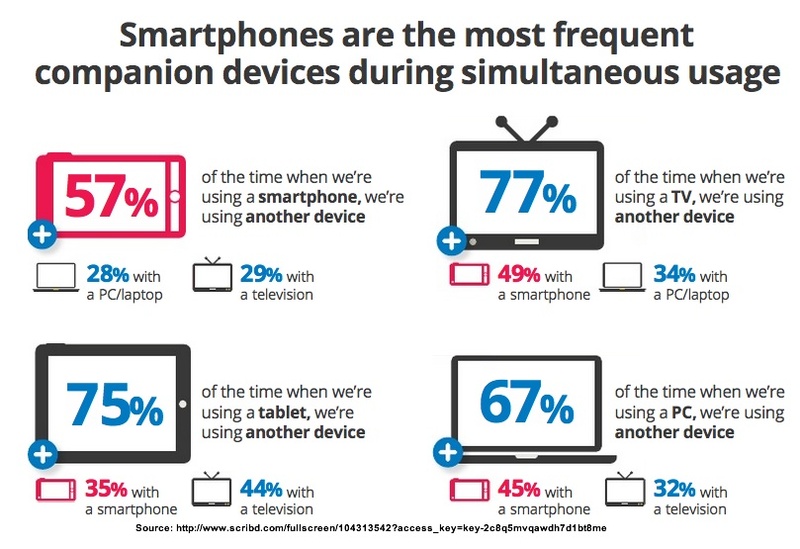 This is where one person uses more than one device at a time. 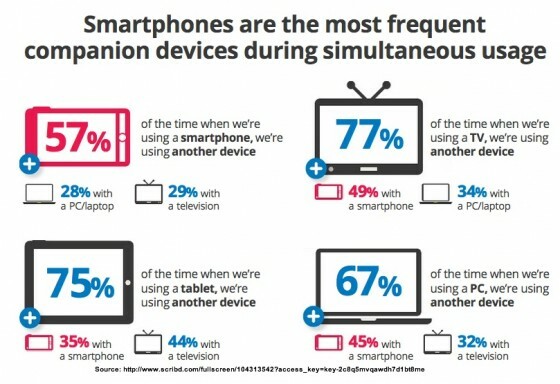 Smartphones are the most frequent companion device. Smartphones are personal devices that enable owners to check information and communicate with others without interfering with their current activity whether it’s work or personal time. By contrast, television has become background noise and information regardless of whatever else we’re doing whether we’re in our living room or in an airport. The top three simultaneous activities are email, Internet browsing and social networking. This is consistent with other research such as Nielsen that found the biggest activity on smartphones is email. In part this is driven by corporate use of Blackberries. Further, since social networking consumes over one out of every five minutes online, it’s not surprising that people use otherwise wasted minutes between other activities to check in and catch up with family and friends throughout the day. Given the availability of at least one other device, we’re able to efficiently get the answer to any question that comes up with a few keystrokes. Multi-tasking. 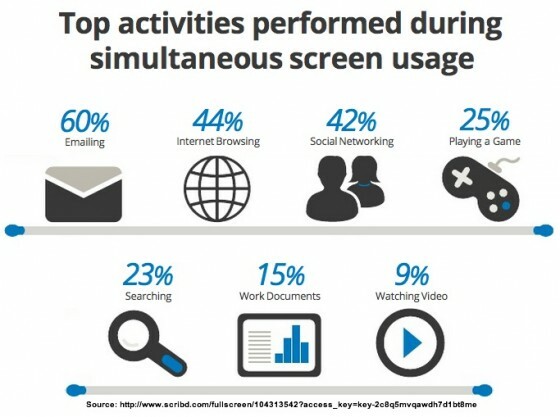 78% of multiple device use is to perform unrelated activities. While handling more than one activity at a time seems more effective, the problem is that it’s not always more efficient as researchers at Stanford discovered. Complementary use. 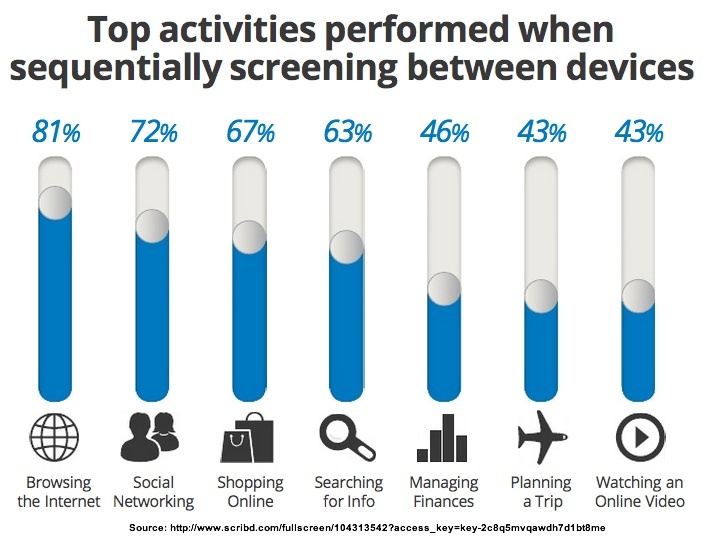 22% of multiple device use is to perform related activities. Increased sequential and simultaneous device usage requires adapting your content marketing to meet the more distracted user’s needs. Here are seven content marketing tactics to maximize multi-screen effectiveness. Create focused, bite size content. To ensure your message is conveyed accurately, keep it short and to the point. Test the use of visual content. Ensure your content (and/or website) is findable across devices. 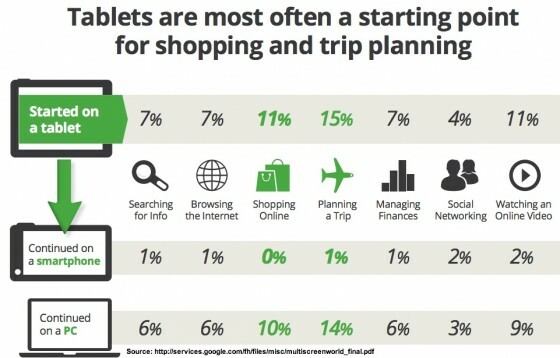 Search is different from mobile search. Allocate budget to both. Display well across devices. Provide readers with equivalent user experience regardless of screen size or format. Don’t assume that your audience is willing to put up with a poorly rendered site on a smartphone or tablet. Make it easy for readers to continue content consumption on another device. Think search, navigation and email. This includes saving information that’s recognized across devices. Consider also that your content may “age” differently on different device types. Keep email focused and actionable. Email is the top activity users try to accomplish in “found” minutes whether they’re on the go or in front of their television. Therefore, use effective subject lines and enable recipients to take action regardless of device. Ensure social media content is device agnostic. Since social media is a top simultaneous activity, there’s a strong chance that participant interaction is on a smartphone or tablet. Reduce keystrokes for any activity. Don’t make me type! This is particularly important when users only have a smartphone or tablet available. To this point, ensure that phone numbers, addresses, email and dates are recognized as such to streamline user actions such as tap to call, map, email and calendar. In today’s multi-screen world, it’s difficult to attract and hold your target audience’s attention since there’s always another distraction within arm’s reach. To this end, ensure that your prospective readers can easily find and consume your content as they move from one device to another. Have you tested any special tactics to attract your audience’s attention in a multi-screen world? If so, what did you do and what were the results? Tags computer, google+, ipsos, Research, smartphone, sterling brands, Tablet. Bookmark the permalink.